1. 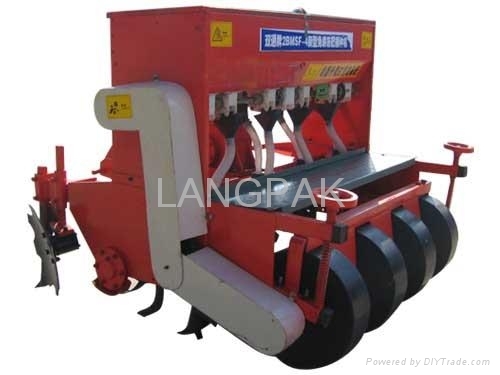 Machine based on scientific methods of cultivation, no-till drill plant wheat, soybeans, sorghum, corn and fertilizer. 2.. Features more than a machine. Both wheat planter, but also a corn planter. 3. Stubble planting can be completed, ditching a ground-breaking, ridge, planting, fertilizing, soil rehabilitation, repression and many other agricultural processes. 4. Wheat grass with a 12 cm, drained cell seeding. 5. Kinds of fields as a nutrient measures, do not burn species, fertilizer concentration. Improve fertilizer use efficiency. 6. Maize quantitative bunch planting, plant spacing and reasonable to adapt to mechanical harvesting. 7. Using the most advanced equipment Fu ridge, deep plum Songane discs, resistance, ridge height adjustable.